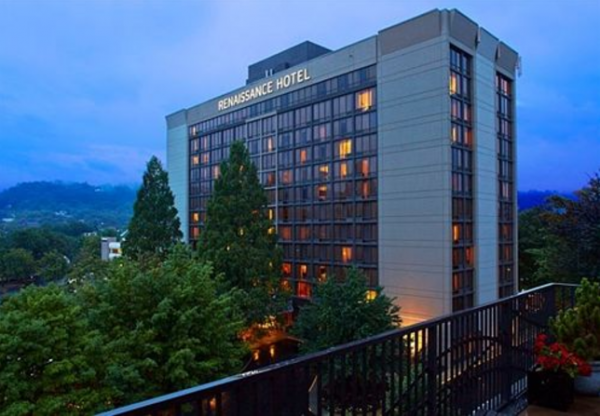 The Renaissance Asheville is one of the premier Asheville hotels nestled in the beautiful Great Smoky Mountains. The hotel offers deluxe rooms and suites that feature complimentary Wi-Fi, premium workstations, 32 inch LCD flat screen TVs, and stunning views of the Blue Ridge Mountains and downtown Asheville. Hotel amenities include dog-friendly rooms, a sparkling indoor pool, a cocktail lounge, 24 hour fitness center, complimentary on-site parking and much more! The hotel conveniently located in the heart of Downtown Asheville, just walking distance to many local attractions and exciting Asheville events. Discover the best Asheville has to offer and explore everything from local breweries to world class museums to adventurous outdoor activities. No matter what you are looking for, the city of Asheville has something for everyone. We highly encourage conference attendees seeking accommodations to book through the AEES room block at the conference venue, the Renaissance Asheville Hotel. A Conference Group Rate is available at the Renaissance Asheville Hotel for $122.00 plus tax – please make note of the Group Reference Number below when making your reservation. Please book your room online by clicking on the link below, or call the Renaissance directly to book your room – 800-468-3571 – and mention the Group Reference Number: M-D563E19 or 19th Annual AEES Meeting. The Group Rate is available until May 3, 2019 and applies to the nights of June 3, 2019 – June 6, 2019. If you are arriving a day early or staying a day late, you will need to make your reservations by phone – do not use the online method.